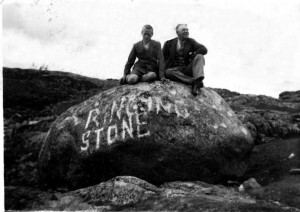 Black & white photograph of Archie MacLean (Whitehouse) and Cornaigmore School headmaster Alan C MacDougall standing by the ringing stone at Vaul in the 1930s. DVD compilation of sections of old films about Tiree, made in 2016 from videos held in An Iodhlann amongst others. Includes footage of: ferries, the Mary Stewart, Scarinish harbour, Scarinish Hotel, the ringing stone, Nester and Gavin Carter’s bakery and bread making, school bus driven by butcher Donald MacLean, The Reef, livestock health, Balephetrish, Mannal, Balemartine, Baugh, Tiree High School, children singing a traditional Gaelic hunting song, accordion music and several accordionists, Gaelic songs sung by locals at a ceilidh, thatched houses and thatching with Hector Brown, Alexander MacNeill’s opinions on thatched houses (1985), Am Bail Ur in Balephuil, Iain MacKinnon talking in Gaelic and English in his house at Kilmoluaig, Hynish harbour and buildings, harvesting and stooks, Cornaig mill, livestock sales, airport, bands, Balevullin, An Iodhlann, Tiree Music Festival, Travee, aerial view of a seal swimming, bicycles, schoolyard games, sheep shearing, Gott Bay pier, cattle, pipe music, shops, ships, Vaul, timelapse film of the sky as the sun sets and rises, young Eilidh Campbell and her brother talk in Gaelic about life on Tiree. Other people include: Ann Carter, Douglas Carter, Sinclair Carter, Olwen Carter, Monica Smith (nee Davis), Neil MacPhail, Angus MacPhail, Mairi Campbell, Bernard Smith, Iain MacDonald, Iain Brown, Iain MacLean, Myra Brown, Hector Campbell, Alex MacArthur, Gordon Connell. Notes about Bronze Age `Rock Art` or ring and cup markings. Handwritten notes, email and printed internet pages about Bronze Age cup markings in rocks. Provided by John Wombell after a visit to West Hynish in 2013, where he found some worked flints (see 2013.94.1). Map of the eastern areas of Tiree from Baugh in the south to the Ringing Stone in the north, at a scale of 6 inches to the mile (1:10,560). Articles appearing in the magazine British Archaeology (Sept/Oct 2009): (1) by Prof. Mick Aston (Time Team) about his visit to Tiree in summer 2009, and the archaeological sites he explored, including the Ringing Stone, duns and medieval stone crosses. (2) Travel log of the team`s visit by Jon Cannon. Six postcards of Tiree by Sue Anderson. Six postcards of Tiree by Sue Anderson: felt-roof house; windsurfing; four views including the broch and ringing stone; Scarinish harbour; the Clansman at the pier; sunrise over Scarinish harbour. Newsletter of the Tiree Heritage Society `Friends of the Tiree Chapels`, No. 7, 17/8/2004. News about the Gaelic version of the Pilgrimage Route Guidebook, the information boards for the chapels, broch, ringing stone and Soroby graveyard, the repairs to the bridges at the Kirkapol chapel site and Tobair Eachainn, funding and fund-raising. Audio cassette recording of Elsie MacKinnon of Lodge Farm, Kirkapol talking to her daughter Fiona MacKinnon in June 1998. Elsie MacKinnon of Lodge Farm, Kirkapol talks to her daughter Fiona in June 1998 about her adoption by Katie MacKinnon in 1925 when aged 9, the differences between Ashford in Middlesex where she came from and Tiree, her schooldays in Scarinish and Kirkapol, the work she did on Saturdays, toys and presents, Sundays on Tiree, the work on the croft, learning Gaelic, the population of the island, school sports, the work her aunt did and playing with friends, a school picnic at the Ringing Stone, the sense of community, fostering children, the people in Kirkapol, the construction of Ormer Cottage and the fire in the Scarinish shop. Black and white postcard of Macolm MacIntyre in 1916. 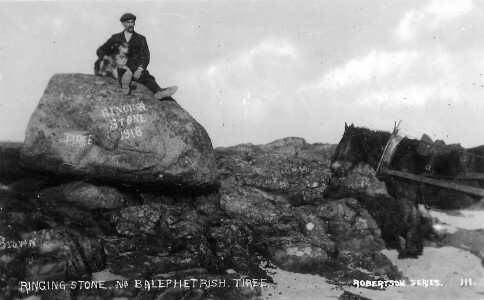 Blacksmith Malcolm MacIntyre of Gott with his dog sitting on the Ringing Stone in 1916. Blacksmith Malcolm MacIntyre of Gott is pictured in this old postcard with his dog sitting on the Ringing Stone. Local legend has it that if the stone is struck so hard that it splits in two then Tiree will sink beneath the waves. Given its name because of the metallic sound it makes when struck, the Ringing Stone has at least 53 cup markings which date from the Bronze Age. 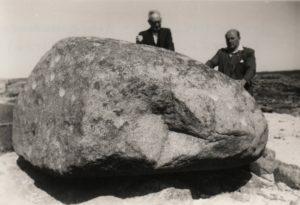 The stone was carried to Tiree by a glacier during the last Ice Age and measures 3.4 metres by 2.4 metres and is 1.8 metres high. Known today in Gaelic as Clach a’ Choire (rock of the hollow), it features in Blaeu’s map of 1654 as Coire Finmackoull showing it had been linked to the Ossianic heroic ballads of the 13th century. Paperback book `Tiree Tales` by Fiona E. MacKinnon translated by Margaret MacKay, 1997. A collection of 25 stories from Tiree by Fiona MacKinnon of Lodge Farm, Kirkapol and translated into Gaelic by Margaret MacKay.